Engaging the community in enviromental activities, education and encouraging understanding and care of their surroundings. Promoting healthy lifestyles and positive mental health by engaging young people and inactive adults in sports and leisure activities. Advising parnerships and organisations including Big Local and Safer Stockton Partnership. Providing mentoring, volunteering and enviromental activities linked to accreditation. 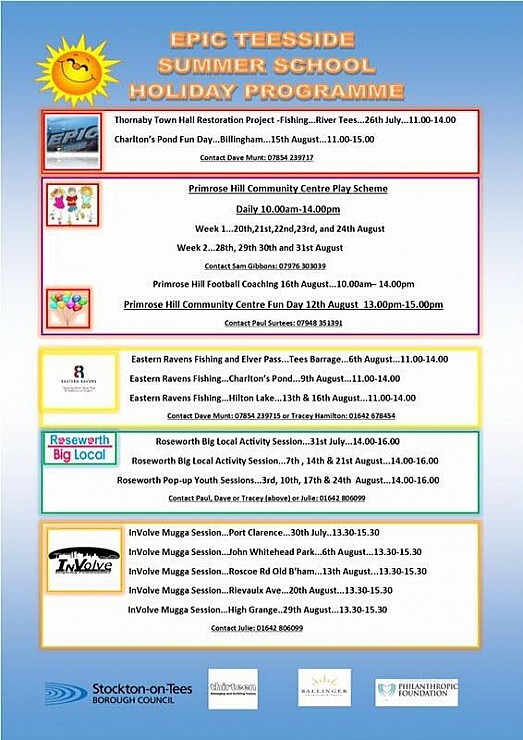 EPIC TEESSIDE CIC provides social inclusion activity to vulnerable young people & families, vulnerable/isolated adults and young unwaged adults in the Tees Valley. This will include Educational, Employment orientated including volunteering, Environmental, Sporting and Recreational activities. Epic will source funds through grants, commissioned activity, consultancy, local fundraising and a charging policy for activity that reflects the needs and the means of customers/clients The Epic Team will work in the community to raise aspirations, expectations and create opportunities for young people to become involved in shaping, creating and delivering services that improve the quality of life in their communities.EPIC will build on the initial success of the project, develop marketing activities and a strong financial plan creating additional funding streams to enhance delivery capacity and to create paid and voluntary opportunities for people in the areas we serve, all of which are underpinned by shared goals, beliefs, and values. If you have seen any services of interest today, please feel free to contact us using the form below or alternatively give us a direct call and we will be happy to help.